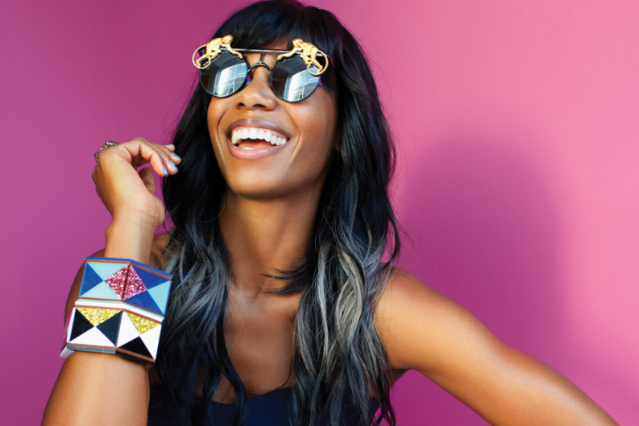 Santigold has become one of the most visionary, kinetic, thrilling artists in pop by following her dreams. No, literally. Losing a bit of chrome to the Bedford-Stuyvesant streets is part of daily reality in one of New York’s still-gritty neighborhoods. And White, a.k.a. Santigold, is devoted to maintaining her connection to the borough that’s nurtured her since the mid-1990s, when she moved to Brooklyn after attending Wesleyan College. She recently relocated — with her husband, snowboarder/musician Trevor “Trouble” Andrew, and their Great Dane, Bo — a mere seven blocks to stay a step ahead of the ripple of gentrification. But just 25 feet away from the now-naked car, inside White’s home, there’s a mammoth Kehinde Wiley portrait occupying nearly an entire wall of the living room, depicting the 35-year-old singer as a conquering war hero wearing a lush blue military uniform with golden epaulettes. The artwork, an homage to “Portrait of an Officer,” Sir Joshua Reynolds’ 18th-century painting of British soldier Banastre Tarleton, is featured on the cover of her new album, Master of My Make-Believe. It is opulent and brash and breathtaking, and its presence in the hood known for producing Biggie and ODB is a fitting manifestation of White’s wondrous ability to keep it real and live a fantasy at the same time.